As SDOT typically does these days, they accepted the bike and pedestrian goals and then threw out the goal of maintaining vehicle throughput. The worst part of that was that they eliminated the two lane car queue for getting onto Stone Way from Green Lake Way, backing traffic all the way up to the lake. 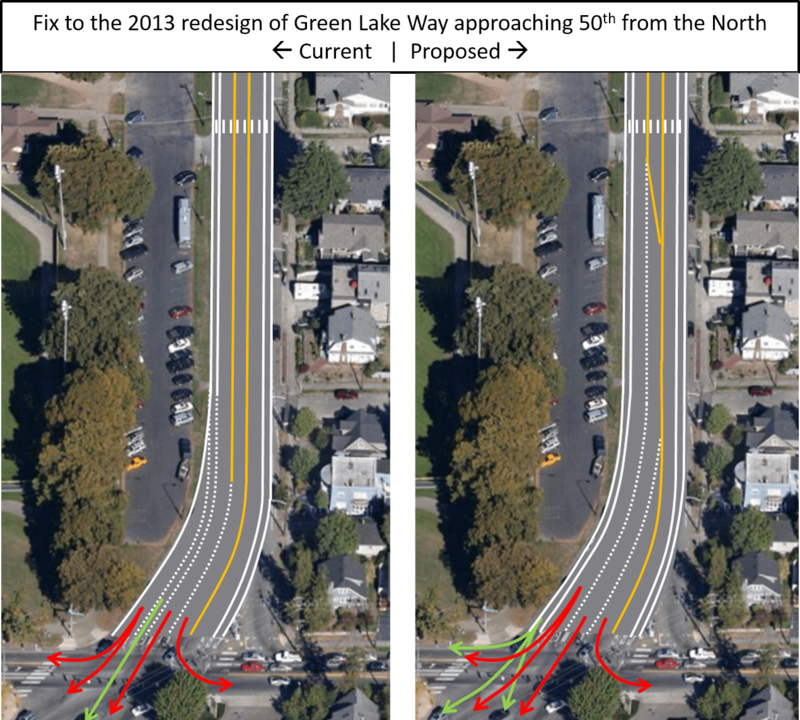 Restore the 2 lane car queue for Green Lake Way south bound all the way back to 52nd, plus allow it to grow further in the mornings as necessary. This should allow many more South bound vehicles through the light cycle, bringing throughput close to what it was prior to the 2013 redesign. Keep cyclists to the side of Green Lake Way all the way to the light when going South bound on Green Lake Way, then change the signal timing so that bikes get to go before the traffic continuing onto Green Lake way. This should make it safer for cyclists going south bound onto Stone Way while also giving cyclists the flexibility to go onto 50th or continue onto Green Lake Way. Finally, tweak the light going north bound so cyclists and pedestrians don’t conflict with cars. This is a continuation of the the Stone Way turning signal. Cyclists going South are stopped and cyclists going North get to go. Vehicles get to go both South bound and North bound, but don’t turn right on 50th anymore, preventing conflicts with cyclists going North and pedestrians crossing 50th. 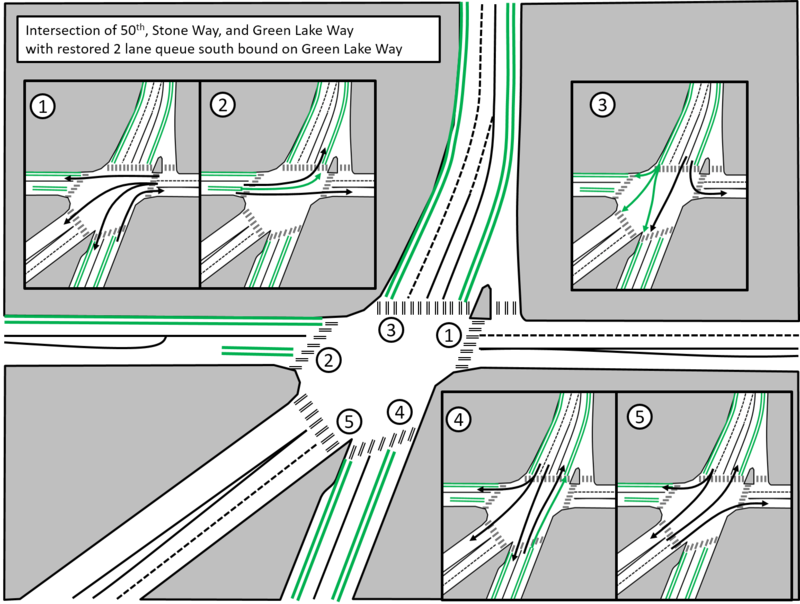 Finally, the Green Lake Way north bound takes its turn going, the same pattern that currently happens in step 3 today (the first graphic), except cars have a separate queuing lane on Green Lake Way south bound and are no longer blocked by traffic going onto Stone Way south bound. As far as I can see, everybody wins. Vehicles gain a 2 lane queue on Green Lake Way south bound while approaching 50th. This should prevent traffic from backing up to the lake and greatly improve throughput at the light. The only semi-loss is that left turns onto 51st would no longer be allowed, but as that’s mostly cut through traffic anyway. Cyclists will gain by having fewer conflicts with vehicles, both while queued at the light and while traveling. Cyclists will also be able to continue onto 50th or Green Lake Way when going South on Green Lake Way instead of being forced onto Stone Way. Pedestrians will be able to cross 50th without having cars turning right at the same time as they are walking. Wow, you read all the way through? Clearly you also need some more meds. What are your thoughts? IMHO, the thing we need to do to fix this intersection is simple: close Green Lake Way South of 50th. The busy 5-way intersection falls a lot: too many cycles, can’t turn left from Stone to 50th, and is annoying for walkers, who may have to wait multiple cycles to get where they’re going. Restoring a grid there will let that be a vanilla traffic signal, and fix all that. It also fixes the mess at 46th&Aurora. I don’t think we’ll miss having the capacity of the diagonal tag of road, as it’s these broken intersections that are the limiting factor..
Roundabout. A big roundabout. A la Europe. No lights, yields only. Potential for protected lanes for cyclists. This intersection screams for a roundabout. Roundabout makes WAY more sense to me than the horrible light timing nightmare that is our current morass and won’t improve under Eric’s much thought out proposal. 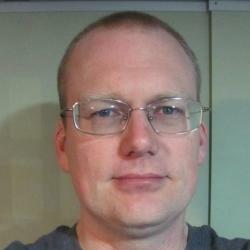 Greg- good find! I’ll fix it right now. Vict- The difficulty with a roundabout is that everybody is going at once and crossing paths- pedestrians, cyclists, cars. It runs the risk of being less safe than a signalized system with clear separation for each type of traveler. It’s also a big change that I don’t think SDOT would consider at this point- I’m thinking of this change for the Neighborhood Project and Street Fund. Having said all that, is there a very similar intersection somewhere that could be a model for a roundabout here? 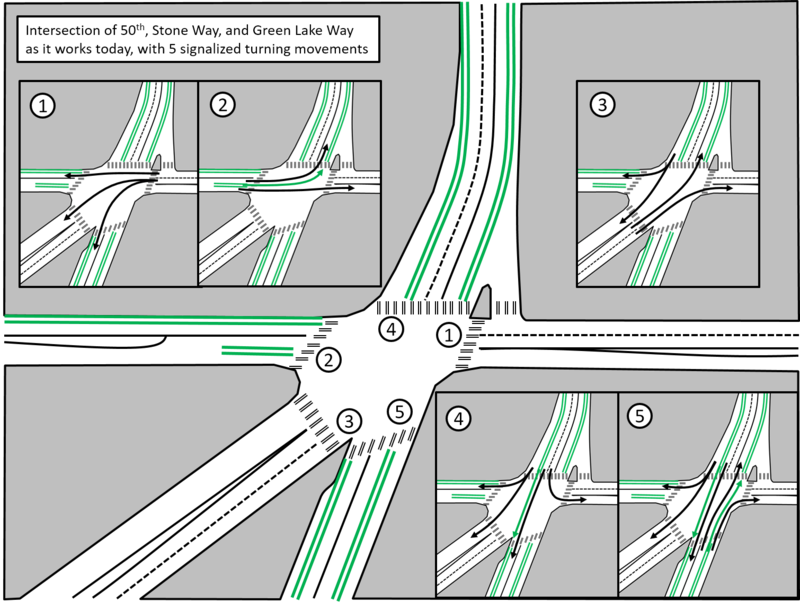 Jeff- As for closing Green Lake Way south of the intersection, I think that’s a non-starter. Green Lake Way carries a ton of traffic, and there would be major losers from that switch- people that are going to suddenly have a lot more traffic in front of their houses. Also, there would no longer be a clear arterial path for getting to Ballard, since once you go up 50th to Phinney you’re blocked from continuing West bound on arterials. Breaking from the grid may have been a mistake in the first place, but I think it’s too late to fix that mistake. I like the roundabout idea. Many busy roundabouts in Europe have signals to force traffic to a full stop in some directions so that other directions get a chance to go. So many times I have been at this intersection waiting what feels like an eternity for no-one to go North/South while the East/West (50th) streets are both backed up so far that not everyone gets through in one light (this is in lower traffic times such as middle of the day or evening). A roundabout would solve this (as would better signal timing). Roundabouts are good for vehicle and cyclist throughput, but not great for pedestrian safety, unless the crosswalks are set far back from the circle. For pedestrians, the safest car is a stopped car. The safest for pedestrian safety is forced slow down actually. Depending on cars to stop by signal is not as safe as mechanism that forces cars to be very slow. Traffic lights typically give pedestrians a false sense of safety, and are not safer than simple jay walking. Could you clarify, what mechanism would you propose here, that forces cars to be very slow? While allowing acceptable arterial throughput. The devil is in the details, of course, but I like this solution on first exposure. I believe there is an error in the graphic for #3 in the proposed sketches: those southbound lanes should be one lane farther West. I like that bicycles keep right – south bound has always had to merge across the right turn lane, and while the striping makes it official it doesn’t change the fact that you’re merging through an arterial lane going uphill. And it’s nice that it works equally for pedestrians and cyclists. I guess the impact of the cycle/pedestrian signal change would depend on how much of the traffic is turning right, vs. south on Stone. If it’s a lot, then you’d be tempted to give the walk/bike a pretty short time, and bicyclists arriving after that window would be tempted to go the old way and merge into the south bound lane. Maybe that’s OK. This is a tough intersection any way you look at it. I put my bike on my bike carrier and drive me and my bike to Green lake to bike the lake. I prefer safety over being scared or run over. If you use that intersection much you may have noticed that sometimes bike riders and car drivers run lights, make cut out of the mess reckless turns and at times change lanes unexpectedly. Why do south bound on Stone Way get to go w/ green light while northbound folks have to wait abotu 5-7 cars before getting a green light? Your proposal makes far too much sense, so given past history I’d expect the city to reject it. SDOT and SPD would have to get a lot better at enforcing no-turn-on-red for this to be safer for cyclists. Having the bike lane in the middle rather than the right means that cyclists don’t have to worry about getting right-hooked by a car sailing through on a right-turn. Roundabout! I’ve been saying North Seattle intersections should be roundabouts for years. Even my super conservative hometown recently converted all intersections to roundabouts. Reykjavik is all roundabouts. Why is Seattle always so behind the traffic times?? The other thing SDOT missed was to make the intersection a scramble for pedestrians–where all cars stop and peds can go wherever they want. Think of the 1st and Pike intersection downtown. With a scramble you can cross diagonally, thereby alleviating the current hassle of waiting through multiple lights to cross. I’m not sure what the fix is (though I am a fan of roundabouts, if people understand them) but as someone who lives 2 blocks from this intersection (49th and Densmore) we have noticed that traffic on Stone Way going north now is much more backed up, and we’re getting a LOT more people cutting through our little street so they can avoid waiting at the light to turn right on to 50th east bound. Holly, I think the reason more people cut and things are more backed up is the “road diet”. It’s been a disaster north of 45th street on Stone and Greenlake Way. Maybe it’s better for cyclists, but for drivers it’s much MUCH worse. Tobin, before the road diet, the city had to take out *all* of the crosswalks between 50th and the lake because they were simply not safe. The road was wide, which caused rampant speeding, and rather than fixing it, SDOT removed the crosswalks. Going back to the way it was before isn’t an option. Drivers might be inconvenienced now, but pedestrians and cyclists were often threatened, and sometimes seriously hurt.